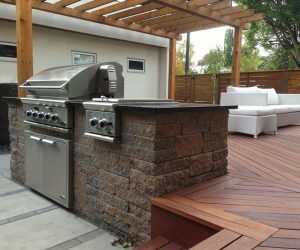 Outdoor kitchens are fast becoming a very popular landscaping addition for many Calgary homeowners. Enjoying the outdoors more often can start by creating your own out door kitchen space. Yes, even with our cooler climate it is possible to create a cozy outdoor kitchen that can be utilized and enjoyed year round. Chinook landscaping and design Inc. Can build you an outdoor kitchen utilizing our courtyard stone products. We can build you a BBQ and burner platform, shelving,counter tops and even stone benches and seating areas. If your interested in a outdoor kitchen you will want to make note of the space you have available in your yard and consider the a purpose would like your yard serve. If entertaining, cooking, and lots of outdoor family time is important to you then an outdoor kitchen may be the perfect addition to your landscape. Our stone outdoor kitchens are built to last and unlike kitchens utilizing wood or steel as their main building component, your kitchen won’t regular maintenance, paint or stain. A great, attractive addition, that adds value to your home and doesn’t require costly upkeep or repairs, now that’s a smart landscaping investment. The appliances used in a outdoor kitchen setting typically use natural gas. We can create and install cozy natural gas heat sources for warmth that will allow you to use your outdoor kitchen more often. Upright natural gas heaters and fireplaces will give you warmth throughout our four seasons.